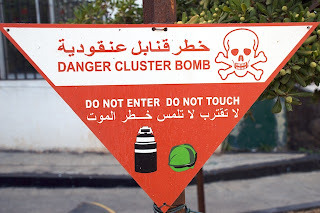 There were no updates to Disarmament Insight’s blog last week as John and Maya were in Southern Lebanon. For a week we were based at the headquarters of the United Nations Mine Action Coordination Centre (UN MACC SL) in Tyre, about 25km north of the ‘Blue Line’ separating Southern Lebanon from Israel, and which is monitored by UNIFIL troops. Why were we there? In July and August 2006, ongoing incidents between the Israeli Defence Force (IDF) and Hezbollah, a non-state armed group, escalated massively, and saw cluster munitions used by both sides. Hezbollah continued to fire katyusha-style rockets from Southern Lebanon at civilian settlements in Northern Israel – inaccurate ground launched weapons at least some of which contained Chinese-manufactured MZD2 submunitions. Following a Hezbollah ambush and kidnapping of IDF soldiers that ignited the conflagration, it seems that Israeli military forces also used the opportunity to try to destroy Hezbollah rocket sites. The IDF itself used cluster munitions, initially airdropped bombs like the CBU58, on various targets in the area. But in the last three days of the conflict (and between negotiation of a ceasefire and its entry into force) Israel used very large quantities of predominantly ground launched cluster munitions such as the M42, M46, M77 and M85. These littered villages, roads and agricultural land with massive numbers of unexploded cluster submunitions. In future posts we’ll explore some hazards of, and responses to, unexploded ordnance contamination as seen in Southern Lebanon. Suffice to say in this post that the 2006 conflict and its aftermath served to highlight the problems the use of cluster munitions creates for civilians both at time of use and post-conflict in terms of clearance and socioeconomic recovery. The 2006 conflict’s consequences added to efforts to raise the alarm about the humanitarian problems that use of cluster munitions cause and, eventually, to the emergence of Oslo Process from February 2007. This process had the goal of achieving a treaty to ban cluster munitions that “cause unacceptable harm to civilians”, and adopted a Convention on Cluster Munitions (CCM) in Dublin on 30 May 2008. So it’s difficult to tell the story of the Oslo Process without understanding what happened in Southern Lebanon in 2006 – and seeing it with our own eyes. And we do intend to tell that story through a negotiating history of the Convention on Cluster Munitions to be published by the UN next summer. Meanwhile, large-scale battle area clearance of unexploded submunitions from villages and agricultural lands continues more than two years after the August 2006 ceasefire. It’s currently the UN MACC SL’s job to coordinate the efforts of a variety of battle area clearance and explosive ordnance disposal assets to tackle the problem of unexploded ordnance. Our week based in the MACC accompanying their staff – to which we are very grateful for their patience and generosity - gave us some insight into the practical challenges they, clearance teams and locals face on a daily basis from unexploded submunitions. More about that in future posts.